Born in Germany in 1879 Bill Ludwig moved to Chicago when he was 8 years old. Ludwig abandoned the violin and piano to focus on playing drums when he was a teenager. Ludwig played professionally at an early age and he soon realized existing bass drum pedals were inadequate. In 1909 he and his brother Theobald (also a drummer) invented an improved bass drum pedal. The new design utilized a spring to keep the beater off of the drum enabling the drummer to create a faster tempo. 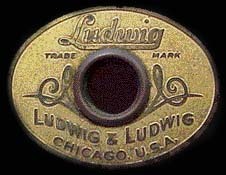 Sales quickly took off and the brothers formed Ludwig and Ludwig to market the new pedal design. Bill continued to travel and play professionally selling pedals when ever possible. Their first drum was actually Tympani which utilized Ludwig designed foot pedals. Theobald Ludwig died in the 1918 flu epidemic causing Bill to dedicate himself to Ludwig full time. Bill as the sole owner/operator of the young company. Ludwig and Ludwig prospered until the depression when they ran into financial problems causing Bill to sell the business to GC Conn manufacturing of Elkhart Indiana. Ludwig remained an employee however he left after GC Conn broke a promise to leave manufacturing in Chicago. 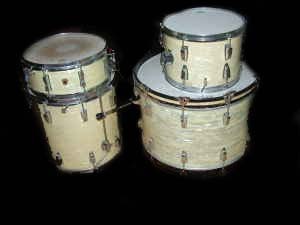 A lack of innovation and poor management by GC Conn relegated Ludwig and Ludwig to a second tier drum manufacturer. Meanwhile in 1937 Bill Ludwig reentered the drum business and started the William F Ludwig drum company. GC Conn threatened to sue Ludwig over the name so Ludwig soon changed his new company’s name to WFL (William F Ludwig Drum Company). Once again innovation launched Ludwig to the forefront of American drums. A Ludwig employee designed a new bass drum pedal dubbed the “speed king”. Additional innovations followed in lug design and materials. Through hard work and perseverance WFL continued to prosper and in 1955 purchased the Ludwig and Ludwig name, assets and patents from floundering GC Conn Manufacturing allowing Ludwig to change the name to Ludwig Drum Company. After continued additional purchases Ludwig reamed the company Ludwig Industries. Ludwig prospered during the 60’s due to Ringo Starr’s use of a Ludwig Oyster Black Pearl set. The Selmer Company purchased The Ludwig Drum Company in 1981. Ludwig still builds many products in the U.S. however manufacturing has moved from Chicago to North Carolina. Recently Ludwig has enjoyed increasing popularity, a trend we expect to continue. We share your passion for Ludwig Drums. Call our shop or drop us a email for our best ludwig drum prices.